We offer an accurate and cost-effective Pem Insertion service. We have grown our capabilities in this area over the years and clients now benefit from our comprehensive set of skills as well as cutting-edge technology to optimise the insertion process and deliver high quality end products. Haeger is globally recognised as a world-class manufacturer of insertion technology solutions and Fabricated Products has invested in 3 of their Pem Insertion machines, which have a variable dwell timer for use with hard materials and an adjustable ram retract position. One machine has been fitted with a bowl feeder for the automatic and speedy insertion of nuts, studs and standoffs. We also use the Haeger Pem insertion machines for sheet metal joining using semi-tubular and solid rivet. 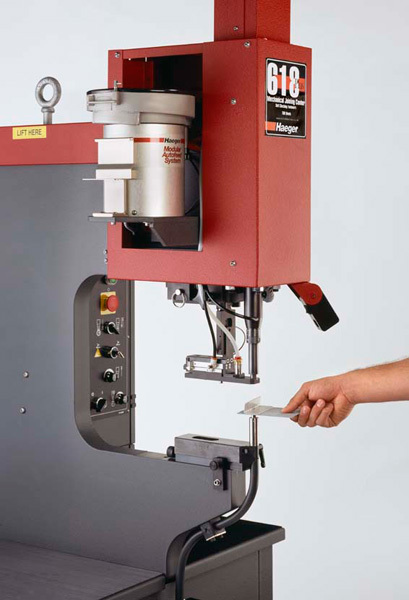 Ultimately these machines, combined with our experience, allows us to achieve a level of control and manufacturing precision that was simply not available to customers in the past. Contact Fabricated Products now to learn more about our Assembly and other capabilities. We can talk through your requirements and offer a cost-competitive quote for a quality service that we believe is second to none in Europe.